This Corgi Dog Canvas Wall Art piece is an unique animal wall art piece for kids room decor , which can make your kids room more lively and brings your kids much more fun ! 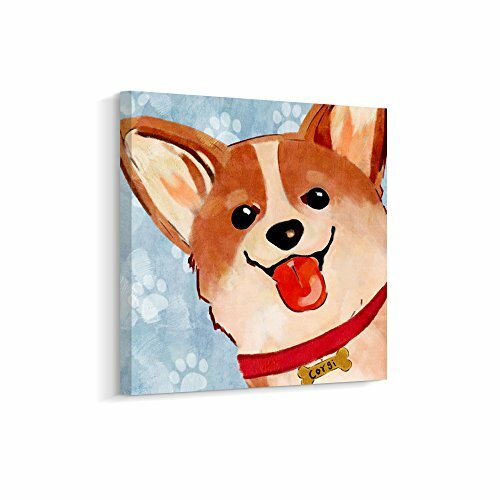 【Professional Techniques】 This Cartoon Corgi Doggy Animal Picture Painting on Canvas Print Wall Picture for Kids Room is originally designed by our young and creative artist named Ye. She always sketches her ideas on paper and finishes the work on computer. Her picture is then printed off on high quality 280g canvas. Our ultra HD printing technique brings her artwork to live . 【Exquisite Craftsmanship 】 This Cartoon Doggy Canvas Picture Home Decor Wall Painting is gallery wrapped, framed and ready to be presented to your walls. It comes with pre-installed hooks for easy operations. The stretcher is made of licensed natural Fir wood and handcrafted by our skilled workers. 【Customer Service】 We pride ourselves in exceeding our customers' expectations. In addition to our stellar reputation as highly rated wall art developer who have been established for more than 20 years, thousands of repeat customers who buy again due to the unparalleled service they have received from us are our true measure of success. PLEASE NOTE: The appearance of this product may vary due to hand painting effects and size. Please contact us if you are unsatisfied with any of our products. If you have any questions about this product by Pinetree Art, contact us by completing and submitting the form below. If you are looking for a specif part number, please include it with your message.